The Elite Four, as the name might suggest, is comprised of four Elite Trainers, some of the best found in the entire Kanto Region. In order to become the Kanto Region Champion, you must first defeat all four Elite Four Members in battle, consecutively no less. 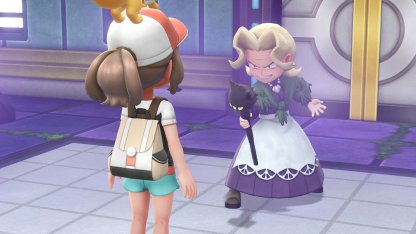 The third member of the Elite Four is none other than Agatha, one of Professor Oak's oldest of friends. Agatha specializes in Ghost Type Pokemon, but since their are very few Ghost Type Pokemon found in the Kanto Region, she will also own a number of Poison Type Pokemon as well. All of her Pokemon will be at Level 53, except for her second Gengar that will be at Level 54. In all, she will battle using Arbok, Gengar, Golbat, Weezing and (a second) Gengar. As mentioned, since all of her Pokemon are either full or part Poison Types, Psychic Type Pokemon do the best when facing her. Ground Types also work wonders, since Poison Types (outside of her Golbat) despise Ground Type Attacks. If you were lucky enough to have caught an Abra on Routes 5, 6,7 or 8 during your journey, its evolutions of Kadabra or Alakazam will come in handy when facing Agatha. If not, Pokemon like Dugtrio, Onix and Golem can easily get the job done for you. If you do decide to go with a Ground Type Pokemon as your primary plan to defeating Agatha, make sure it also has a Rock Type Attack (which most of them can learn) to deal with her pesky Golbat.